As a current senior in college eagerly awaiting graduation this spring, the topic of landing awesome internships and jobs is pretty popular among my friends and I. Because I’ve learned so much, I thought I would reflect back on some of the invaluable learning experiences I’ve had throughout my college career. At my university, they require us to hold an intern position at a company that’s relevant to our majors. Not all schools have this requirement, but I’m so glad that mine does! Because of that, I was lucky enough to intern for LaurenConrad.com last fall (read: dream come true!). So, today I’ve decided to put everything in writing for all you LaurenConrad.com readers. Doing your research means spending time getting to know the company that you’ll be interning for. Peruse their website, check out their social media, soak in the way they interact with their clients and familiarize yourself with their mission statement. I find that it’s easier to get the most out of an internship if you immerse yourself into the culture of the company you’re interning for. Office environments tend to vary but I think we can all agree how important it is to dress appropriately. Skip the plunging necklines, extra spritz of perfume, and sky-high heels that are reserved for your next GNO. You want everyone in the new office to take you seriously and know that you mean business. For an in-depth list of foolproof ways to nail chic office attire, click here. The individuals that you work with are going to be the ones you spend the most time with, and they will probably be the ones you learn the most from. Pick their brains. Find out what they bring to the table. The more you get to know people, the easier it will be to understand what that company is looking for in an employee. Let’s be honest: You aren’t always going to befriend everyone (we can help you in that department too, just click here), but at the end of the day, it is important remember to always remain professional. Tardiness is the first sign of unreliability and unprofessionalism. Being on time goes hand in hand with first impressions and will establish what kind of employee you’re going to be. If you know that you’re going to be late, be sure to notify your supervisor ahead of time so that they know when to expect you. Just as they saying goes, “The only stupid question is the one left unasked.” You will learn so much more when you kick your nerves to the curb and ask away! It is better to ask questions than to keep your mouth shut and risk completing a task incorrectly. I can pretty much guarantee you that your supervisor will appreciate your curiosity and will be more than happy to answer your questions! Remember, everyone has been the “new girl” at some point in their lives. First days, first jobs, first anythings are bound to shake your nerves. Keep your chin up and know that you’re doing the best you can, and that’s all anyone can ask for. 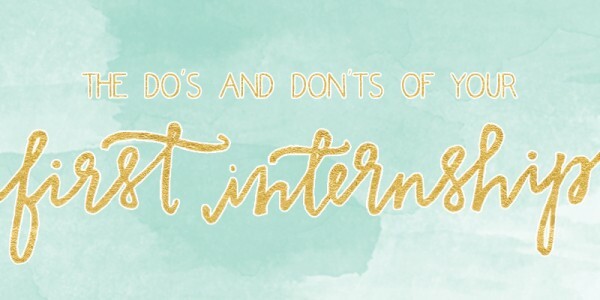 I hope that these tips help alleviate your nervousness and steer you down the right path during your first internship! What are some of your tips for successfully navigating your first internship experience? And what are some topics you’d like to see me cover in the future? I’d love to hear your suggestions in the comments below! P.S. A big thank you to Courtney of POPPYjack Shop for creating the gorgeous image above!